CHICAGO--(BUSINESS WIRE)-- The Hyatt Regency brand celebrates its debut in Southern China’s Fujian Province with the opening of Hyatt Regency Fuzhou Cangshan. Merging traditional Chinese culture with modern conveniences, Hyatt Regency Fuzhou Cangshan strives to become the gathering place for business and leisure travelers. The Hyatt Regency brand experience is designed around one objective: to connect today’s travelers to who and what matters most to them. With the beautiful Wulong River and nearby Qi Mountains serving as a majestic backdrop, Hyatt Regency Fuzhou Cangshan welcomes guests inside with a jasmine-themed design and Fujian courtyard-style architecture inspired by the cultural heritage of this more than 2,000 year-old city. Starting at the hotel’s lobby, Hyatt Regency Fuzhou Cangshan impresses with an energizing combination of natural light from the atrium and intricate, linear jasmine-themed designs throughout the interior of the hotel. This timeless jasmine flower motif echoes through the grounds, from the ever-present fragrance in the air to the wood-carved petal designs on the door of each room. Iconic local elements are cleverly incorporated throughout the hotel, such as the circular Tulou, an enclosed and fortified earth building. 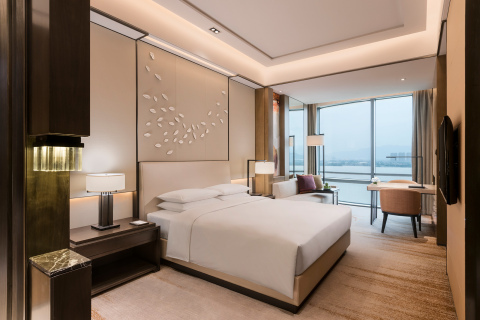 Hyatt Regency Fuzhou Cangshan features 226 intuitively designed rooms and suites, ranging in size from 473 square feet (44 square meters) to 2,626 square feet (244 square meters). The guestrooms have been built to integrate experiences that cater to the personal needs of the travelers with private foyers, large walk-in closets, bluetooth-controlled speakers, 48-inch LED televisions, and bathrooms with separate toilet and shower/bathrooms. Most guestrooms offer unobstructed views of the adjacent Wulong River and the Qi Mountains in the distance through floor-to-ceiling glass windows. Hyatt Regency Fuzhou Cangshan features four restaurants offering authentic local and global flavor. From authentic Fujian cuisine to fine European fare, the hotel provides multiple options for quick drinks, business lunches, intimate dinners or casual dining experiences. In line with the hotel’s signature flower, The Lounge serves an energizing Jasmine Ice Tea made using freshly harvested leaves from nearby Wuyi Mountain. It also offers traditional Chinese “kung fu” tea ceremonies for guests, live musical performances and a range of a la carte fare from the East and West throughout the day. The Market Café brings in fare from around the world as the hotel’s bustling all-day dining venue. The market-style buffet offerings are served fresh out of live show kitchens and a tantalizing dessert counter, while à la carte options are instantly prepared to guests’ requests. A specially designed Kids’ Corner offers little ones their own mini buffet and entertainment options, from toys to board and video games. The menu at La Cucina is filled with traditional fare from Sicily, Sardinia and other regions of Italy. Highlights include delectable thin-crust pizzas, fresh salads, handmade pastas and signature desserts. High ceilings, brick walls and woody, leather-clad interiors bring a level of relaxed sophistication, while a central pizza oven and an open kitchen bring an authentic, visual feast straight to the table. Min Wei, the hotel’s signature Chinese restaurant, offers authentic local Fuzhou and Cantonese fare in one of the city’s most exclusive settings. Set around a green, open-air courtyard, the timelessly designed restaurant serves authentic local specialties including Buddha Jumps over the Wall, wok-fried pork kidney and “lychee” meatballs. The opening of the new Hyatt Regency Fuzhou Cangshan provides an opportunity for Hyatt to build on its Meetings, Incentives, Conferences and Exhibitions (MICE) leadership in Asia Pacific. Featuring more than 28,298 square feet (2,629 square meters) of pillarless, naturally lit event space, the hotel the perfect venue for a variety of events such as weddings, social banquets, exhibitions, meetings, and conferences. The hotel’s main event venue is the Regency Ballroom on the first floor, which offers a high-ceilinged 12,916-square-feet (1,200-square-meter) space that takes after the hotel’s jasmine flower motif and offers a separate entrance to provide organizers additional flexibility and privacy. The ballroom also uniquely gives organizers the ability to incorporate cars into their event, with entryways large enough for automobiles to enter and be showcased on the floor. An additional eight function rooms on the second floor range from 785 square feet (73 square meters) to 2,906 square feet (270 square meters), all of which provide river views and flexibility for groups of any size. Weddings are catered to with a spacious bridal room and a private lawn and outdoor gazebo during the warmer months. Complimentary high-speed Wi-Fi and smart and intuitive communications equipment ensures efficient, state-of-the-art experiences. For more information, please visit www.fuzhoucangshan.regency.hyatt.com. Hyatt Hotels Corporation, headquartered in Chicago, is a leading global hospitality company with a portfolio of 12 premier brands and 679 properties in 54 countries, as of September 30, 2016. The Company's purpose to care for people so they can be their best informs its business decisions and growth strategy and is intended to create value for shareholders, build relationships with guests and attract the best colleagues in the industry. The Company's subsidiaries develop, own, operate, manage, franchise, license or provide services to hotels, resorts, branded residences and vacation ownership properties, including under the Park Hyatt®, Grand Hyatt®, Hyatt Regency®, Hyatt®, Andaz®, Hyatt Centric®, The Unbound Collection by Hyatt™ , Hyatt Place®, Hyatt House®, Hyatt Ziva™ , Hyatt Zilara™ and Hyatt Residence Club® brand names and have locations on six continents. For more information, please visit www.hyatt.com.